Blue Juniper from Baby Name Ponderings has been profiling names from horror films all October in the lead-up to Halloween, and here you can read about such fabulous finds as Amity, Romero, Dresden and Mockingbird. Perhaps this helped inspire me to do a name from an Australian horror film for October 31. Lake Mungo came out a few years ago, but I only managed to catch it last year on DVD, after missing it on television. It’s one of those movies which is probably better to see on the small screen, because the film is made in the style of a TV documentary. This makes comparisons to The Blair Witch Project and Paranormal Activity inevitable, but I think it’s better than both of these, and avoids any annoying shaky camerawork. It’s not a horror movie with buckets of blood, hordes of screaming teens, or bizarre demonic cults, but a supernatural mystery thriller that is extremely tense and uneasy to watch – it is definitely a “scary” film. It’s about the grieving process after death, about the secrets that people take to the grave, and about the images left behind when someone dies that haunt us. It also asks the viewer to try to decide which events in the film are “real” and which aren’t – a process made all the more difficult that the closer you look, the less sure you become. What I loved most about Lake Mungo was its complete authenticity – it’s one of the realest films I have ever seen, and even though when I put the DVD on, I knew it was “just a movie”, during the course of watching it I even began to doubt that. Rumour has it that this film is going to be remade by Hollywood, but I urge you to watch the original instead. For starters, the distinctive Australian voice of the film would be lost. 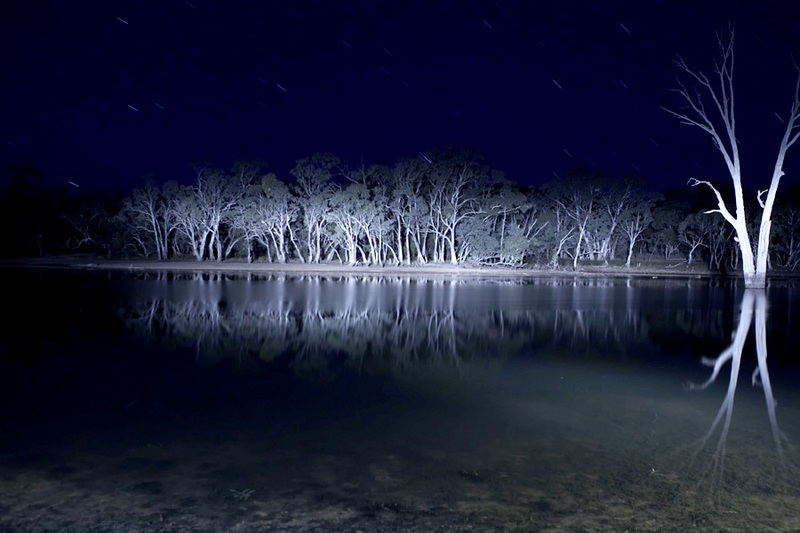 Although the movie is set in country Victoria, as the title suggests, Lake Mungo plays an important role. This is a salt lake in south-western New South Wales, which has been completely dry for several thousand years. Although geologically rich and part of the World Heritage listed Willandra Lakes region, it is most famous for the archaeological discoveries that were made there in the late 1960s and 1970s. These were of human remains, the bones of a young woman and two men. The woman and one of the men had been ritually cremated and decorated with red ochre. The other man, of a later time period, had been carefully positioned in a shallow grave, his bones stained pink with the ochre surrounding him. The oldest archaeological site discovered in Australia, and amongst the oldest evidences of cremation in the world, they demonstrate a culture which was sophisticated enough to have developed spiritual beliefs and elaborate funeral rites for their dead. The dating of the remains has been difficult and controversial, but they are currently accepted as being at least 40 000 years old, and very possibly more. The bones have also been dated as being at around 68 000 thousand years. This was slightly upsetting for scientists, as it is thought that modern humans migrated from Africa around 60 000 years ago. 68 000 years would mean that the first humans to leave Africa went straight to Australia, which would involve at least some sea travel. This idea didn’t seem workable and it was revised down to 40 000 – however, some research hints that the older dating may not be as far fetched as first thought. Even more controversially, when mitochondrial DNA testing of the bones was done, it was found that they were genetically different to Aborigines, and to all of us (although they would have looked much the same). As the theory is that modern humans came out of Africa (which explains why everyone on earth is very closely related), where did these Lake Mungo humans that weren’t closely related to us come from? Somewhere else, or is our genetic heritage more complex than first thought? This basically upset everyone, and as a result it seems to have been decided not to do any further research on them, lest we discover more upsetting things. All in all, I think this makes Lake Mungo the most interesting place in Australia, and the remains that were found here the most fascinating things in Australia, and probably the world. There are secrets here more ancient and mysterious than anything you will see at Halloween. Before it was declared a national park in 1979, the land Lake Mungo lies upon was part of Mungo sheep station. The station was named by the Cameron brothers who owned it, after St Mungo’s church in Scotland, of which they had seen a picture. It’s not known which St. Mungo’s church they named it after. Mungo was the nickname of Saint Kentigern, who was born in the 6th century, in a British kingdom which is now part of Scotland. Of royal but illegitimate birth, he was brought up in Fife by Saint Serf, who was ministering to the Picts. Saint Serf is supposed to have given him his pet name Mungo, of which the meaning is unclear. It’s been suggested that it is British for “my dear one”, or “dearest”, based on similar-sounding words and phrases in Welsh. K.M. Sheard says that the meaning of the name is linked to the saint’s real name, because Kentigern means “chief dog, lord hound” – a very common combination of words in ancient British names. She notes that Mungo looks to be derived from the British for “my dog”, which has close equivalents in Irish and Welsh. The name would thus have been an affectionate way of saying “my pet”, probably with connotations of “my dearest follower” or “my most loyal companion”. According to legend, Saint Mungo performed four miracles, one of the most touching restoring to life Saint Serf’s pet robin. He is a patron saint of Scotland, and of the city of Glasgow, which has on its crest of arms images to represent the miracles of Saint Mungo. As such, it is a name with close ties to Scotland and the north of England, where the name was given in honour of the national saint. You will find references to Saint Mungo in at least two works of fiction. In G.K. Chesterton’s Father Brown detective stories, Father’s Brown’s former parish was St. Mungo’s, in Essex. In the Harry Potter books by J.K. Rowling, the London hospital in the wizarding world is St. Mungo’s Hospital for Magical Maladies and Injuries. Rowling may have been influenced in her choice of saint because according to local traditions, Saint Mungo encountered the bard and prophet Merlin, cured him of madness, and converted him to Christianity. In Australia, the MacCallums have produced four generations of intellectuals all named Mungo – the youngest a long-serving political commentator known for his staunchly pro-Labor views. The actor Mungo McKay has a horror connection, as he has been in the films Undead and Daybreakers. In Australian records, people called Mungo do mostly have Scottish surnames, and many in the 19th century seem to have been named in honour of Scottish explorer Mungo Park. I can see that some people are going to have problems with the name Mungo, but there’s something rather endearing about the name and the saint, and it has several associations with mystery and magic. In Australia it connects us to the most ancient peoples of our land, and an enigma locked away forever. If you’re looking for a Scottish heritage choice with a fashionable O-ending, yet yearn for something out of the ordinary, Mungo may be one to consider. Aww, I love Mungo. He feels cheerful and upbeat. But then again I’m a sucker for Scottish names. I think he sounds pretty cheery as well. I actually think Mungo would make a cool name. Reminds me of Magnus. I love the history and meaning behind it. I quite liked Lake Mungo. I watched it with my mom, who thought it was real, when she found out it was a fake documentary, she was really mad, LOL. I told her from the beginning it wasn’t a real documentary. I sympathise with your mother – I also knew it was fake before watching it (I’d read about in the TV guide), but somehow in the course of watching it I started to wonder. I also saw a comment in a forum from someone who was convinced it was real – and he actually knew one of the actors in it! Mungo sounds villainous to me, I can’t really imagine it on a person.